A gigantic spaceship is near a black hole. The TARDIS materializes in an empty control room. Missy (Michelle Gomez) steps out. Missy: “Hello. I’m Doctor Who. And these are my plucky assistants. Thing one and… the other one.” Bill (Pearl Mackie) and Nardole (Matt Lucas) step out of the TARDIS unhappily. Cameras are following their movements; an alarm goes off. A man comes on screen asking who they are. Missy vamps for the cameras and says, “Well, I am that mysterious adventurer in all of time and space known only as Doctor Who. These are my disposables, Exposition and… Comic Relief.” Bill objects that Missy is calling the Doctor, “Doctor Who”. Missy tells her the Doctor’s real name is Doctor Who; he picked it himself. Missy: “He dropped the Who when he realized it was a tiny bit on the nose.” The Doctor disputes this. While this is going on, Nardole is getting information on the ship. It is 400 miles long and 100 miles wide, and it is near a black hole. The ship sent a distress call, and the engines are in reverse; it is clear the ship is slowly trying to go in reverse so it won’t be drawn into the black hole. The man who they were talking to storms into the room armed. He is a blue person and his name is Jorj (Oliver Lansley). He asks if any of them is human. The mere suggestion of being human insults Missy. Something is coming up the elevator and he becomes more agitated. The Doctor comes out of the TARDIS to calm him down. Bill admits that she is human. The Doctor tries to tell him he is there to help him, but this doesn’t help. He shoots a big hole through Bill. Bill looks shocked; and above the hole, her jacket has a button that expresses how everyone is feeling, WOW! There is a flashback before this ill-fated mission started, at the University. The Doctor tells Bill he wants to take Missy on a field test. Bill asks why. The Doctor explains that Missy was his first friend, that he even had a ‘man crush’ on him. Bill: “Time Lords, a bit flexible on the man-woman thing then?” Doctor: “We’re the most civilized civilization in the universe. We’re billions of years beyond your petty human obsession with gender and its associated stereotypes.” Bill: “But you still call yourselves Time Lords?” The Doctor continues, “We had a pact, me and him. Every star in the universe — we were going to see them all. But he was too busy burning them. I don’t think she ever saw anything.” The Doctor continues explaining his and Missy’s relationship: “She’s the only person I’ve ever met who’s even ‘remotely’ like me.” Bill: “So, more than anything, you want her to be good?” The Doctor believes that Missy can change. Bill expresses her concern: “She scares me. She really scares me. So promise me one thing, yeah? Promise you won’t get me killed.” We immediately go back to the image of Bill with a big hole through her. Back in the University flashback scene, the Doctor jokes about how fragile human beings are with only one heart and no backup. Bill again asks him to try and he says he will within reason. We flash to the present. Bill falls backwards. People with hospital gowns carrying IV drips come off the elevators. They shuffle like reanimated corpses and they are there to retrieve Bill’s body. They won’t let the Doctor come with them. When the Doctor asks if they are going to help Bill, they say they will repair her but they aren’t bringing her back. The Doctor gives Bill a subconscious message, “Wait for me.” After they take Bill, the Doctor has some questions for Jorj. This is an empty colony ship, which had a crew of 50. They were on their way to picking up colonist when the black hole started pulling them in. They sent 20 members of the crew to the bottom of the ship to help reverse the engines, but they never returned. Soon new life forms appeared. The rest of the human crew was taken away. Jorj is not human, so they didn’t take him. Bill wakes up in a horrifying hospital with a huge plate over her chest, covering the big hole through her body. The creepy surgeon (Paul Brightwell) tells her, “full conversion wasn’t necessary, but it will be in time.” Bill sees an image of the Doctor telling her to “wait for me”. She hears someone with a mechanical voice saying “pain” repeatedly. Bill goes to investigate and hides when she hears someone in the hallway. A nurse (Alison Lintott) and an unkempt person named Razor (?) walk pass her. Razor sees her but he doesn’t say anything to the nurse. Bill walks into a ward of people in hospital gowns covered head to toe, sitting by their IV drips. She finds the person saying pain. Bill hides before the nurse sees her; the nurse goes to the patient and turns the volume down so she can’t hear him. She doesn’t do anything to relieve the pain. When she leaves, Bill goes over to another patient who keeps moaning, “Kill me, kill me.” Bill apologizes to the patient since there is nothing she can do for the patient. Bill sees a window and looks out upon a devastated city. One of the patients sneaks up on Bill but Razor knocks the patient out and asks Bill if she wants tea. Bill follows Razor to his work area. Razor: “Do you want the good tea or the bad tea?” Bill: “What’s the difference?” Razor: “I call one ‘good’ and the other ‘bad.’” Bill: “I’ll take the good one.” Razor: “Excellent. A positive attitude will help with the horror to come!” Bill: What horror? !” Razor: “Mainly the tea.” Razor has a TV and on the screen is the Doctor, Nardole, Missy and Jorj frozen in time. Razor explains the effect of the black hole on time. The Doctor is also explaining it to Nardole. The bottom part of the ship is closest to the black hole, so time is moving faster there. Therefore, everyone on the top portion of the ship looks frozen. The lifeforms that appeared are the descendants of the original crew. Razor tells Bill that everyone is dying here; they have to go through conversion for everyone to survive. Bill keeps seeing the Doctor telling her to “wait for me”, but she goes outside the hospital to see the city. People are weak, sick, and dying because of the atmosphere. Razor tells her about Operation Exodus where people go through conversion so they will be strong enough to leave this place. For Bill, she has spent years here. In that time, she and Razor became good friends. For the Doctor, it has only been 10 minutes since Bill left. The Doctor arrives and assigns Missy to the computer while he and Nardole look for Bill. Razor shows up where Missy is. Missy ignores him while he talks to her. He tells her it took him awhile to work out who she is; she has been to this Earth like planet before. On the computer screen, she sees Mondas. She suddenly understands what is going on. Razor takes off his disguise and reveals himself as the Master (John Simm). The Master: “Hello, Missy. I’m the Master. And I’m very worried about my future. Give us a kill!” The Doctor and Nardole come upon a Cyberman; they ask it if it knows where Bill Potts is. The Cyber-woman tells them she is Bill Potts and with a single tear running down her face tells the Doctor she waited for him. The Master and Missy join them and a shocked Doctor hears the Master gleefully say this is the genesis of the Cybermen. Poor Bill! She had a feeling this mission was doomed from the beginning but the Doctor would not listen to her. She expressed her fears of Missy and asked the Doctor not to let her die. Bill isn’t dead, just something much worst, she is a Cyberman now. Missy didn’t cause this; Missy’s previous reincarnation as the Master did. Bill would have been better off if she stayed behind this one time and made chips. It felt like the Doctor was willing to sacrifice Bill and Nardole’s lives for a chance to restart his friendship with Missy. When you travel with the Doctor, you are always in danger; this trip felt more foolhardy than the rest. The Cybermen in this episode are old school Cybermen, in fact the Mondasian Cybermen are the first iteration of the Cybermen. The first Doctor met them in the episode “The Tenth Planet”. Mondas was a twin planet to Earth, which left our orbit and went out into space. The people started getting weak and dying from the deterioration of their environment, so to survive they began upgrading themselves, turning themselves more machine than human. Here’s a link to a scene from that episode. Nu-Who has had the Cybermen on before, but this was the best iteration they have had. 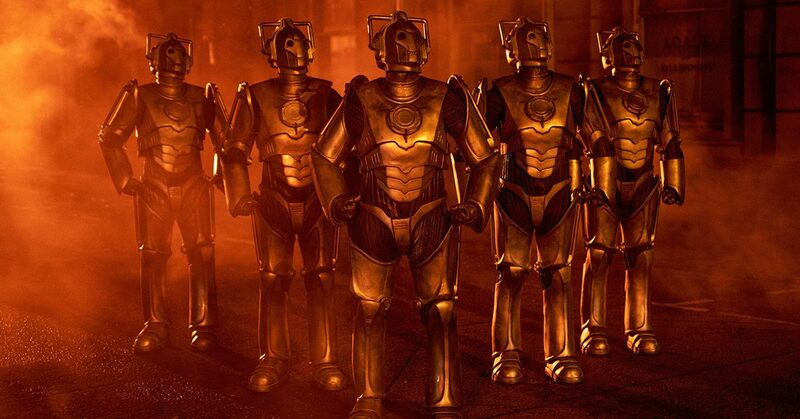 The newer version of the Cybermen seems like your typical killer robot, while the Mondasian Cybermen feel like humans who have gone down a very dark and scary path. They are to be pitied as much as feared. What a great episode. It would have been an all-time great episode if I hadn’t known that the Mondasian Cybermen were coming back, and that John Simm was appearing as the Master. The way popular shows like Doctor Who are covered, the info would have leaked, so I understand the BBC using this information to advertise the show, but the shock of seeing John Simm tearing off that disguise would have been priceless. I figured out it was him before the reveal, only because I knew he would be on the show, and I noticed something about Razor that seemed familiar. If I hadn’t known he’d be on the show, I wouldn’t have guessed it. Regardless, this episode was great. The opening scene with Michelle Gomez saying she was Doctor Who and cleverly putting down Bill and Nardole was hilarious. The flashback with the Doctor and Bill at the University was terrific. The chemistry between Peter Capaldi and Pearl Mackie was in full display. One of the things I’m going to miss most about this season is seeing Capaldi and Mackie act with each other. I hope that sometime in the future the two will be in another project together. 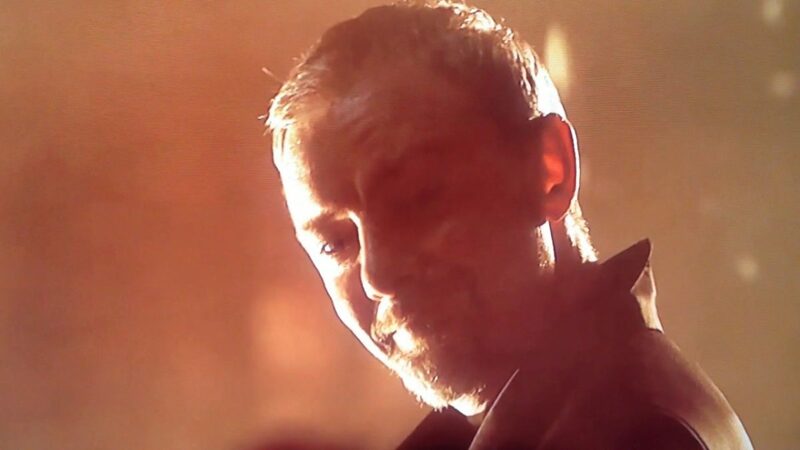 This was the best appearance of John Simm as the Master. In the past I felt he went a little bit over the top, I really couldn’t take him seriously as a threat to the Doctor. Here, he felt calculating and menacing. The way he became Bill’s friend as Razor and then led her to her conversion as a Cyberman just before the Doctor could rescue her was fiendish. The scene with the single teardrop falling down Cyberman Bill’s face will be an iconic shot for the show, with her saying she waited for him. It was very heartbreaking. I have really enjoyed this season, and if the season finale matches this episode’s quality, it could end up being my favorite season. Here’s a bonus clip of the Doctor meeting the Mondasian Cybermen.